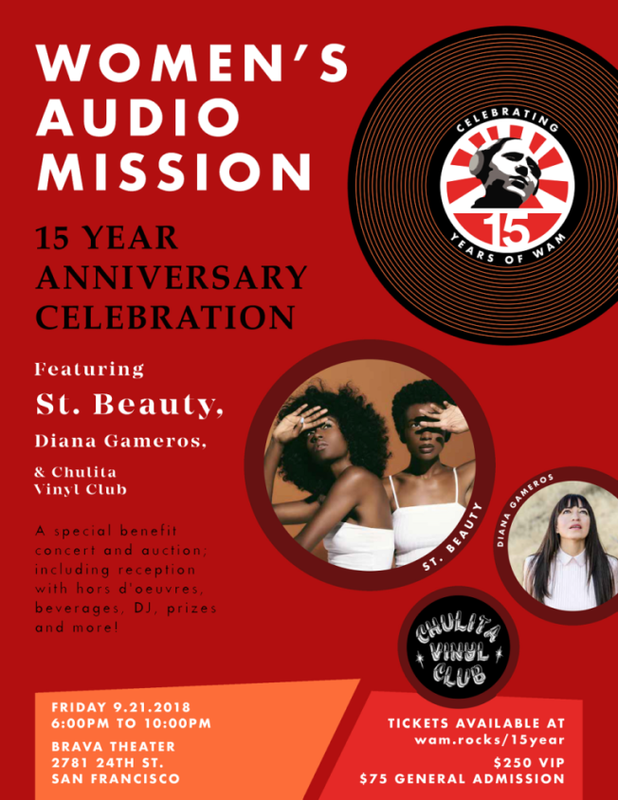 The Women’s Audio Mission is celebrating its 15 Year Anniversary with a special benefit concert and auction including hors d’oeuvres, beverages, DJ, prizes and more. The concert will feature performances by the artists St. Beauty, Diana Gameros and Chulita Vinyl Club. WAM has created the only hands-on, after school curriculum specifically tailored for girls and based on both the California Department of Education and National Core Media Arts Standards. The program provides girls with tuition-free training and access to musical instruments, technology and young women mentors. GOTM partners with 20+ schools/organizations throughout the Bay Area to provide after school programming year round. WAM uses music and media to attract and connect 1,200+ underserved Bay Area girls (ages 11-18) every year to free STEM/creative technology training, mentoring, and career/educational counseling. WAM has cracked the code on a hands-on, project-based curriculum that attracts and retains girls in STEM studies, training the largest number of girls in STEM studies in Northern California year-round. WAM uses music and media to attract and connect 1,200+ underserved Bay Area girls (ages 11-18) every year to free STEM/creative technology training, mentoring and career/educational counseling. WAM has cracked the code on a hands-on, project-based curriculum that attracts and retains girls in STEM studies, training the largest number of girls in STEM studies in Northern California year round. WHEN: Friday, September 21, 2018 6:00 - 10:000 p.m.